M18 FMTIWF12 - M18 FUEL™ ½˝ mid torque impact wrench with friction ring Torque Range 130Nm to 813Nm. Supplied in a Milwaukee Job Site Tool Box as pictured. M12 CIW38 - M12 FUEL™ compact ⅜˝ impact wrench with friction ring Torque Range 23Nm to 158Nm. Makita DLX2173TJ 18v LXT Lithium Ion Brushless 2 Piece Cordless Twin Pack, DHP459 Brushless Combi Drill and DTD153 Brushless Impact Driver – Includes 2 x 5.0ah Batteries In Makpac Carry Case with 29 Piece Bit Set Stock Code: DLX2173TJ_P-57087 Model DHP459 Cordless Hammer Driver Drill. Developed specially for light to medium duty drilling and fastening applications. The DTD153 Cordless Impact Driver developed specially for light to medium duty fastening applications. Both models are equipped with a brushless motor DC motor specially designed to provide, above all, more work amount on a single full battery charge. Makita DHP459 Features Include: Compact design with an overall length of only 192mm. Single sleeve keyless chuck allows for easy bit installation/removal by one . Makita DLX2131J LXT 18v Twin Pack DHP482 Combi Drill DTD152Z Impact Driver Stock Code: DLX2131J The DLX2131 High Speed 18v Twin Kit from Makita replaces the DLX2012 Twin Kit and contains models DHP482 and DTD152 with 2 x 3.0Ah Lithium-Ion Batteries. The DHP482 18V LXT Combi Drill from Makita is a compact and precise power tool for the professional or DIY enthusiast. It features an all-metal gear construction for extra high transmission durability as well as an electric brake and variable speed control trigger. You will find this an extremely comfortable drill to use with its ergonomic soft grip handle and lightweight design. Model DTD152 is a cordless impact driver powered by 18V Li-ion battery and developed for main applications such as tightening of self-drilling screws or. Ryobi Power Tool Set. All items are in good working order as seen on the picture. MAKITA 18v 2 Piece COMBI DRILL HP457D and IMPACT DRIVER TD127D Set. 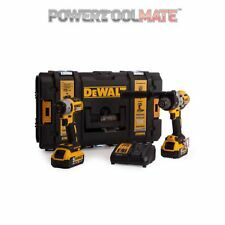 A Fantastic Impact Driver and Combi Drill Kit. 1X COMBI DRILL. 2X 18V BATTERY. 1X IMPACT DRIVER. The machine is fitted with a single sleeve keyless chuck, to enable easy bit installation and removal. Workzone Titanium 18v Hammer Drill & Impact Driver Set - Brand New. Condition is New. 1 x M18CN18GS Brad Nailer in Dynacase. 1 x M18CN16GA Finishing Nailer in Dynacase. M18CN16GA Finishing Nailer Features M18CN18GS Brad Nailer Features M18CN16GA Finishing Nailer Specification M18CN18GS Brad Nailer Specification. 1x HP457D Combi Drill. HP457D Combi Drill. Battery Compatibility: 18v G-Series Lithium-Ion. 2x BL1813G 1.5Ah G-Series Li-ion Batteries. Torque Settings: 16 Drill. 1x TD127D Impact Driver. Forward / reverse rotation. Silverline Pt No. 952498. No load speed 0-350/0-1250rpm. Impact driver features No load speed 0-2200rpm. Variable speed trigger and reverse. 16 2 torque settings and reverse. Building a good toolkit is expensive. Makita DLX2145TJ 18v LXT Li-on Twin Pack DHP458 Combi Drill, DTD152Z Impact Driver, 2 x 5.0ah Batteries and Charger Stock Code: DLX2145TJ_P-67701 This Makita DLX2145TJ twin pack is now supplied in one of Makitas stacking Makpac Cases housing the DHP458 combi drill, DTD152Z impact driver, 2 x 5.0ah Batteries and Charger. Also include Makita 21 Piece Bit Set. Features of DHP458 The Makita LXT 2-speed DHP458 combi drill develops up to 88Nm torque. Now with new and improved Lithium-Ion battery technology offering more power and duration with the added benefits of being lighter and more compact. Enhanced dust and drip-proof performance for use in outdoor applications or harsh environments. Single sleeve keyless chuck allows for easy bit installation/removal by one hand. Twin LED job. Einhell TE-CI 18 Li 18 V impact driver. A used twice item in fantastic condition. As you can see by the pictures the item is in fantastic condition and virtually unmarked. Makita BL1830B Li-ion 3.0Ah Battery. 3 x Makita BL1830B Li-ion 3.0Ah Battery. Model: BL1830B (194204-5). The Makita DHP482Z 18V Li-ion Cordless Combi Drill from Makita replaces the DHP456Z and is a compact and precise cordless combi drill for the professional tradesman. If you are looking for a decent cordless setup with good batteries, you will know that this is top of the line stuff. If you go on Screwfix, they are there for £300 right now. Come without original case !! Workzone Titanium 18V. Powerful 18V fan cooled motor. Despite my best efforts problems may occur but I will do all i can to resolve the issues. Colour: Red. Places like London Congestion zone, Ireland, Isle of Man and parts of Scottish Highlands.